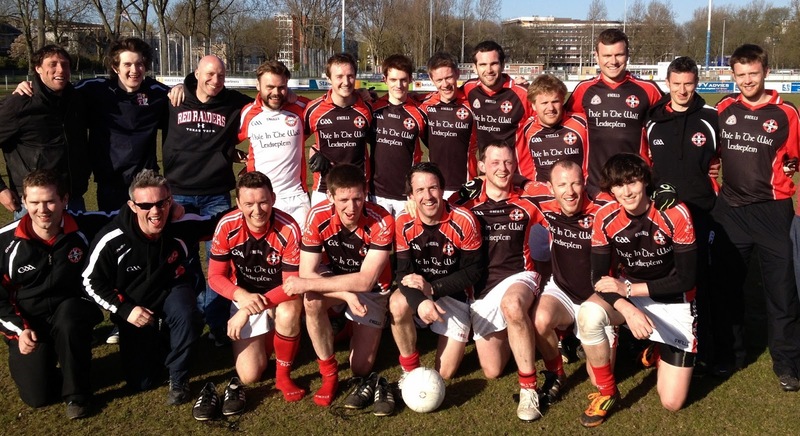 On April 20th, the first round of the Benelux Gaelic Football Championship took place in Den Haag, on a fantastic sunny afternoon. Amsterdam A and B were competing in the Championship and Shield competitions. Amsterdam A played 4 group games against Belgium A, Den Haag, Luxembourg and the newly formed Eindhoven team. The first match saw our boys perform really well, with lots of intensity and focus and win deservedly against a talented Den Haag team, 0-8 to 0-4. There were good performances in defense by Derek Lowry, Rob Ducie and Sean Fitzgerald, while in attack the score board was kept ticking over by Fergal Walsh, Gerry Sheridan and captain Martin McClean. In the second game, Amsterdam A took on newcomers Eindhoven. Amsterdam team took an early lead in the first half and ran out comfortable winners in the end, 3-04 to 0-3 despite a spirited second half rally by Eindhoven. The third game was a tense and physical game against Luxembourg which was drawn 0-9 to 0-9, with Amsterdam grabbing two late scores to level the match. There were great performances by Ruairi and Sean in defense whilst Ivan Stynes and Martin McClean battled hard to edge the midfield contest. The final group game saw Amsterdam A take on Belgium A. Both teams battled hard but the breaks fell to Belgium in the first half which allowed them to pick up a 6 point lead at half-time. The second half followed the same pattern with Belgium taking their scores and Amsterdam failing to take theirs. The game finished 0-3 to 3-6. With two wins and a draw in the group stages, Amsterdam A qualified for the final vs Belgium A. This match was a very different affair from the earlier group game. Amsterdam dominated possession and chances with great performances from Ivan Stynes, Rob Ducie and Sean Fitzgerald. There was 2 points separating the team going into the final 3 mins of the game before Belgium pulled away to win it by 6 points 0-7 to 2-07. 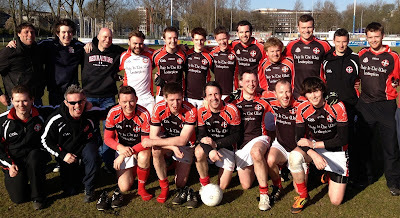 In the shield competition Amsterdam B played their first round game against Dusseldorf, and while short on numbers, with 3 new team members taking part, there were promising signs for the future. Our lads battled well but were beaten by the better team 1-02 to 1-07. In the second group game, Amsterdam B put in a much better performance and were unlucky to lose out by just a point in the end to Belgium B, 1-05 to 1-06. There were great performances by Ronan, Aiden and the three new boys - Ronan, Emmett and Niall.